It’s been an extremely busy year and I didn’t realise how much so until now. I’m shattered, I tell you. Shattered. However, I do like end of year lists (or any kind of list, really) so I’ll foist my best of 2011 on y’all. I tend to read books that aren’t too current as I’m always a little behind, so there’ll be a mixture of new and old books. 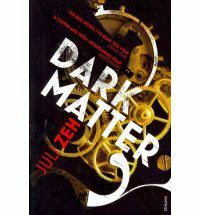 Dark Matter by Juli Zeh – because she manages to segue science with philosophy into a thrilling mystery without dumbing down. I’ve been recommending this book left, right and centre. Deadhouse Gates by Steven Erikson – resparked my interest in the amazing world of the Malazan Book of the Fallen. Will be taking the remaining two on holiday with me in Jan.
Great House by Nicole Krauss – SO beautifully written. Ilustrado by Miguel Syjuco – audacious and ambitious. This guy knows how to write. Maybe This Time by Alois Hotschnig – vividly creepy yet sparse. A Moveable Feast by Ernest Hemingway – makes you fall in love with Paris all over again. The Suicide Shop by Jean Teulé – clever, light and yet very, very dark. Talking About Detective Fiction by P.D. James – very bad for your TBR. We Have Always Lived in the Castle by Shirley Jackson – nostalgically creepy. Who Was Changed and Who Was Dead by Barbara Comyns – deliciously dark and eccentric. I’m currently in the midst of The Hunger Games obsession. They are SO good. And then I’m planning to read Snuff by Terry Pratchett because I so deserve it and I’m worth it. I loved The Suicide Shop, and got a copy of his second novel Monsieur Montespan yesterday. Dark Matter went straight into my wishlist after your original review, so interesting other books to check out too, although Nicole Krauss hasn’t previously been my cup of tea. Just added We Have Always Lived in the Castle and Great House onto my TBR list. Your last three are the ones I would love to get my hands on. Looks so yummy. I still need to read Great House even though I’ve read every single book by her husband and The History of Love. I should probably add that to the “to-read” list. I loooved We Have Always Lived in the Castle. What a book! It’s one of those that it seems almost wrong to compare with other books! I’m reading these post with pencil and paper in hand, which is good as there are several titles here that I’ve added to my list. My library has the Hotschnig-which will be coming home with me sometime soon. I also really need to read Nicole Krauss! Have a great New Year and happy reading in 2012! Lovely, varied list – I’m delighted to see the last two, of course! Although Dark Matter didn’t quite make my top books list I did buy it as a Christmas present because I thought it was so good and perfect for the recipient. Also delighted to see that Comyns made the cut. You’ve also reminded me that I must read some Hemmingway. Also, I hear you on the shattering year front! Happy new year Sakura!! End of the year lists are even more fun than other lists, hm? Thanks for posting your favourites; you’ve nudged a couple up my TBR list for sure!